The Nobel laureate and former US vice- president, Al Gore, has urged Americans to abandon electricity generated by fossil fuels within a decade. Mr Gore compared the scale of the challenge to that of putting a man on the moon in the 1960s. He said it did not make sense that the US was borrowing money from China to burn oil from the Middle East which then contributed to climate change. Critics say weaning the US off fossil fuels is not possible within a decade. Mr Gore, who won the Nobel Peace Prize last year for his work on climate change, insists his goal is achievable and affordable. "The answer is to end our reliance on carbon-based fuels," he said in a speech in Washington. "When you connect the dots, it turns out that the real solutions to the climate crisis are the very same measures needed to renew our economy and escape the trap of ever-rising energy prices." To secure this green revolution, Mr Gore said the single most important policy change would be to "tax what we burn - not what we earn". Mr Gore's speech elicited huge cheers from a packed conference hall near the White House, but whether his message is taken up in the presidential election campaign depends on how much the electorate warms to his vision, says the BBC's Warren Bull. 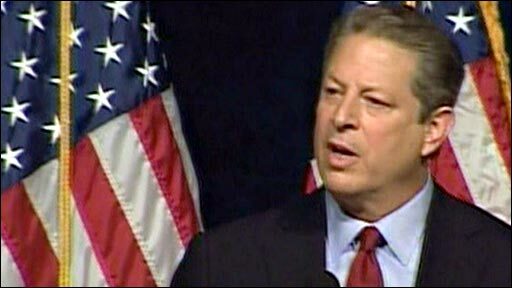 Mr Gore said US presidential contenders Democrat Barack Obama and Republican John McCain were way ahead of most politicians in the fight against global climate change. They appear to agree on the need for progress on green issues, says our correspondent. President George W Bush has often been criticised for not doing enough to tackle climate change. At the recent G8 summit of developed nations in Japan, he did move the US closer to a consensus on climate change, by agreeing to language which makes achieving 50% cuts in greenhouse gas emissions by 2050 a G8 "vision". Electricity generated from non-fossil sources amounted to almost 28% of the total in 2007, according to US government figures, with most of that coming from nuclear power. Hydro-electric stations generated nearly 6% of US electricity needs and other renewable sources such as wind, solar and wood accounted for 2.5%. Burning coal provided almost half of US electricity last year. Mr Gore's ambitious plan would still rely on nuclear energy for a fifth of America's energy needs. Many see the goal as unachievable. Robby Diamond, president of a bipartisan think tank called Securing America's Future Energy, said weaning the nation off fossil fuels could not be done in a decade. "The country is not going to be able to go cold turkey," he told the Associated Press. "We have a hundred years of infrastructure with trillions of dollars of investment that is not simply going to be made obsolete."